Things Fall Apart is a 1958 English-language novel by Nigerian author Chinua Achebe. It is a staple book in schools throughout Africa and widely read and studied in English-speaking countries around the world. It is seen as the archetypal modern African novel in English, and one of the first African novels written in English to receive global critical acclaim. The title of the novel comes from William Butler Yeats' poem "The Second Coming". London: William Heinemann, 1958. First Edition. Very Good/Very Good. First edition, first printing. Bound in publisher's red cloth with spine lettered in gilt. Very Good with fading to cloth at spine and edges, foxing to textblock edge and several pages, lacking rear free endpaper. In a Very Good unclipped dust jacket with toning to spine and edges, soiling, wear and light chipping at corners and spine ends. 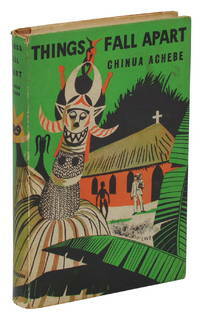 A lovely copy of Nigerian novelist Chinua Achebe's magnum opus, the most widely-read modern African novel. New York: McDowell, Obolensky, 1959. First American Edition. Hardcover. Near Fine/Very Good. First American edition, first printing. Signed by the author on the title page. Near Fine, with faint edge wear, bumped corners, pages toned, small tape stain to front paste down and correspondingly to front dust jacket flap. In a Very Good first issue dust jacket with publisher's price intact, exhibiting light rubbing and light edge wear. A lovely signed copy of Nigerian novelist Chinua Achebe's magnum opus, the most widely-read modern African novel. New York: McDowell Obolensky, 1959. First Edition. Hardcover. Very Good. First American edition, first printing. Second state jacket with reviews on back panel, "Obolensky" only on spine panel. 215 p. Very Good+ in Very Good dust jacket. Former owner's info written on fep, price stamped there as well. A bit of wear to cloth along bottom edge. The orange on the jacket's spine panel is faded, some rubbing and scuffing, wear at head and tail, price-clipped. Nigerian novelist Chinua Achebe's magnum opus, the most widely-read modern African novel. New York: McDowell Obolensky, 1959. First. hardcover. near fine/very good(-). 8vo, gray cloth, d.w. New York: McDowell Obolensky, (1959), First Edition. The second issue dust wrapper (reviews on the back panel) is chipped at the edges & corners; ownership name on flyleaf, end-papers slightly toned, but a very good copy of Achebe's first, well loved novel of Nigeria. New York, New York, U.S.A.: Ivan Obolensky, 1959. Book. Good. Hardcover. First Edition. 8vo - over 7¾" - 9¾" tall. Clean and tight First Edition in Good condition. Minor shelfwear, mostly on corner tips; notes ffep; neat underlining and a margin note or two on a few pages. Dust Jacket in Poor condition - tattered on edges, front inner panel separated from front; half of DJ spine is split along edge so it forms a flap on the spine, a couple of pieces missing at top of spine. Better than no DJ at all, but just barely..
London: Heinemann Educational Books. Nearly fine copy. 1966. Later prt.. softcover. 8vo, 187 pp., Signed by the author on the front free endpaper, The first volume of the African Writers Series . McDowell Obolensky, 1959. Very good with slight dampstain to a portion of the lower half inch of the rear board (and barely visible at the bottom of the spine), not affecting the interior pages. Otherwise clean and tight. In a very good dust jacket ($3.75 price intact) with corresponding internal stain, barely visible on the exterior. Some light wear to the corners and a chip to the bottom edge of the front panel, but overall quite attractive. A very nice copy of this scarce title, one of the most important novels to come out of Africa in the 20th Century.. 1st Edition. 2010-10-15. New. Ships with Tracking Number! INTERNATIONAL WORLDWIDE Shipping available. Buy with confidence, excellent customer service! Everyman's Library. Used - Good. Former Library book. Shows some signs of wear, and may have some markings on the inside. 2010-10-15. Good. Ships with Tracking Number! INTERNATIONAL WORLDWIDE Shipping available. May not contain Access Codes or Supplements. May be ex-library. Shipping & Handling by region. Buy with confidence, excellent customer service! 2002-01-02. New. Ships with Tracking Number! INTERNATIONAL WORLDWIDE Shipping available. Buy with confidence, excellent customer service! London: Heinemann, 1984. Paperback. Very Good. Illustrated by Uche Okeke. Signed by Achebe on the title page. Very Good in wraps, some rubbing to the spine and back wrap. Square and firmly bound with toned pages. Achebe's classic novel of colonization in 19th century Nigeria. Named to Time's list of 100 best English-language novels from 1923 to 2005. 1987-08-04. New. Ships with Tracking Number! INTERNATIONAL WORLDWIDE Shipping available. Buy with confidence, excellent customer service! 2007-02-07. Good. Ships with Tracking Number! INTERNATIONAL WORLDWIDE Shipping available. May not contain Access Codes or Supplements. May be ex-library. Shipping & Handling by region. Buy with confidence, excellent customer service! 2005-01-04. New. Ships with Tracking Number! INTERNATIONAL WORLDWIDE Shipping available. Buy with confidence, excellent customer service! 2002-05-04. New. Ships with Tracking Number! INTERNATIONAL WORLDWIDE Shipping available. Buy with confidence, excellent customer service! 1996-06-05. New. Ships with Tracking Number! INTERNATIONAL WORLDWIDE Shipping available. Buy with confidence, excellent customer service! 1982-06-09. New. Ships with Tracking Number! INTERNATIONAL WORLDWIDE Shipping available. Buy with confidence, excellent customer service! 2009-08-09. Good. Ships with Tracking Number! INTERNATIONAL WORLDWIDE Shipping available. May not contain Access Codes or Supplements. May be ex-library. Shipping & Handling by region. Buy with confidence, excellent customer service! 2008-05-02. New. Ships with Tracking Number! INTERNATIONAL WORLDWIDE Shipping available. Buy with confidence, excellent customer service! 1994-01-02. New. Ships with Tracking Number! INTERNATIONAL WORLDWIDE Shipping available. Buy with confidence, excellent customer service! 1985-07-08. New. Ships with Tracking Number! INTERNATIONAL WORLDWIDE Shipping available. Buy with confidence, excellent customer service! 2008-08-07. New. Ships with Tracking Number! INTERNATIONAL WORLDWIDE Shipping available. Buy with confidence, excellent customer service! 1971-02-07. New. Ships with Tracking Number! INTERNATIONAL WORLDWIDE Shipping available. Buy with confidence, excellent customer service! 1994-09-09. New. Ships with Tracking Number! INTERNATIONAL WORLDWIDE Shipping available. Buy with confidence, excellent customer service! 1995-07-05. New. Ships with Tracking Number! INTERNATIONAL WORLDWIDE Shipping available. Buy with confidence, excellent customer service! 1995-07-05. Good. Ships with Tracking Number! INTERNATIONAL WORLDWIDE Shipping available. May not contain Access Codes or Supplements. May be ex-library. Shipping & Handling by region. Buy with confidence, excellent customer service! 1995-09-02. New. Ships with Tracking Number! INTERNATIONAL WORLDWIDE Shipping available. Buy with confidence, excellent customer service! 1986-08-02. New. Ships with Tracking Number! INTERNATIONAL WORLDWIDE Shipping available. Buy with confidence, excellent customer service! 2009-04-05. New. Ships with Tracking Number! INTERNATIONAL WORLDWIDE Shipping available. Buy with confidence, excellent customer service! 2007-05-09. New. Ships with Tracking Number! INTERNATIONAL WORLDWIDE Shipping available. Buy with confidence, excellent customer service! 1988-02-06. New. Ships with Tracking Number! INTERNATIONAL WORLDWIDE Shipping available. Buy with confidence, excellent customer service! 1994-10-01. Good. Ships with Tracking Number! INTERNATIONAL WORLDWIDE Shipping available. May not contain Access Codes or Supplements. May be ex-library. Shipping & Handling by region. Buy with confidence, excellent customer service! 1994-09-08. New. Ships with Tracking Number! INTERNATIONAL WORLDWIDE Shipping available. Buy with confidence, excellent customer service! 1999-05-05. New. Ships with Tracking Number! INTERNATIONAL WORLDWIDE Shipping available. Buy with confidence, excellent customer service! 2002-05-08. New. Ships with Tracking Number! INTERNATIONAL WORLDWIDE Shipping available. Buy with confidence, excellent customer service! Heinemann International Literature & Textbooks, 1986-01-01. Paperback. Used:Good. 1992-03-08. Good. Ships with Tracking Number! INTERNATIONAL WORLDWIDE Shipping available. May not contain Access Codes or Supplements. May be ex-library. Shipping & Handling by region. Buy with confidence, excellent customer service! 2005-03-31. Good. Ships with Tracking Number! INTERNATIONAL WORLDWIDE Shipping available. May not contain Access Codes or Supplements. May be ex-library. Shipping & Handling by region. Buy with confidence, excellent customer service! 1997-03-07. Good. Ships with Tracking Number! INTERNATIONAL WORLDWIDE Shipping available. May not contain Access Codes or Supplements. May be ex-library. Shipping & Handling by region. Buy with confidence, excellent customer service! Macmillan Education, 1974-07-01. New edition. Paperback. Used:Good. 2009-06-07. Good. Ships with Tracking Number! INTERNATIONAL WORLDWIDE Shipping available. May not contain Access Codes or Supplements. May be ex-library. Shipping & Handling by region. Buy with confidence, excellent customer service! Heinemann Educational. Hardcover. 0435121626 New Condition. . New.